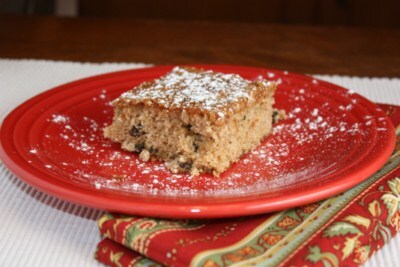 Applesauce cake is one of those great old fashioned desserts. It is a frugal, yet really good dessert. It is a dessert that many of our grandmothers and great grandmothers made for many years. This is what I call a comfort food type dessert. An easy and simple dessert, made from everyday ingredients that most of us have in our cupboards. There are many versions of applesauce cake. This one is adapted from a Paula Deen recipe and it is really good. Tomorrow I will post the gluten free version of this cake that I came up with. Preheat oven to 350. Grease a 13x9x2″ baking pan. Cream together the granulated sugar and shortening until fluffy using an electric mixer. Add the eggs one at a time, beating well. In another bowl, sift together the flour, cinnamon, cloves, nutmeg, baking powder, and salt. Stir the raisins and nuts into the flour mixture. Add the flour mixture and applesauce alternately to the creamed mixture, beginning and ending with the flour. Pour the batter into the prepared pan. Bake for 45 minutes or until the center of the cake is firm to the touch. Hi Lynn I love the old fashioned desserts. Plus its from my girl paula deen I bet it was very tasty. Thanks for sharing the recipe. I was interested in your Applesauce cake as my Granny use to make one with layers. I’m going to attempt to duplicate hers soon. I can’t wait to see how closely it resembles it. Yours looks yummy too! .-= Candi @ Family Stamping and FOOD´s last blog ..Party Foods…Anyone? =-. I’m going to try this one tomorrow. It sounds delish! What a great recipe. It sounds wonderful. Thanks for sharing. .-= Jean Stockdale´s last blog ..Joy in the Journey Lecture 10 =-. I was writing your Applesauce Cake recipe and noticed that at the end of the recipe it mentioned nutmeg. It was not in your list of ingredents. I assume that it would call for 1 teaspoon, like the cinnamom!!! Yes, my husband does not like nutmeg, so I always leave it out, but try to add it to recipes on my site since most do enjoy it. Sorry about that.